Modern isn’t a word ordinarily used to describe Horse Feathers. The acoustic quartet plays slow-burning, minimalist folk that uses lyrics indebted to the Southern Gothic school of literature to craft albums inspired by seasons. (Thistled Spring, the group’s third and latest record, represented the titular season, while predecessor House With No Home was linked to winter.) Even the band’s name (a phrase meaning nonsense) is antiquated. However, Idaho-born guitarist-vocalist-frontman Justin Ringle contends that his band’s approach is more modern than you’d think—and that it’s also not folk. Before Horse Feathers visit the Fox Theatre on Friday, Dec. 10 and the Hi-Dive on Saturday, Dec. 11, with Y La Bamba and Bare Bones, he spoke to The A.V. Club about the real meaning of folk, going digital while staying analog, and how his adopted hometown affected his work. The A.V. Club: You had family members who were in a string band and grew up around rock and country, but what specifically led you to the acoustic sound you use today? 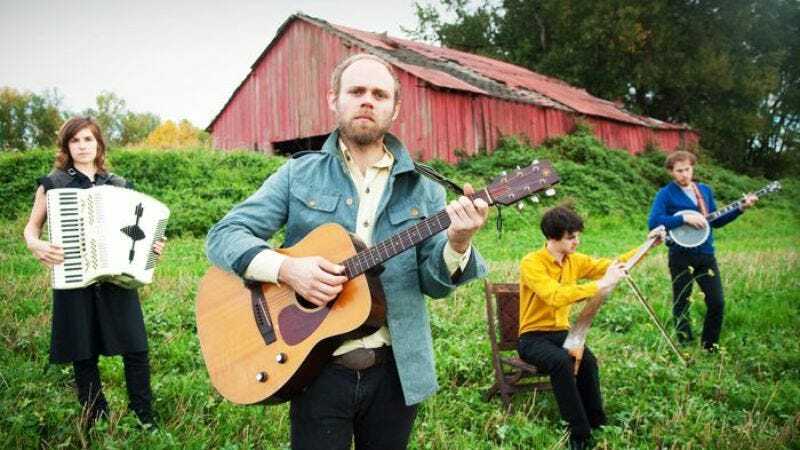 Justin Ringle: I was familiar with [country and string band music], but I grew up listening to mostly indie rock from Seattle, Portland, and Olympia on Sub Pop, Kill Rock Stars, Up Records, and K Records. That was the most abundant and available stuff for me to see live as a teenager. I eventually tired of playing in rock bands when I was about 22. I started to dive into roots music—acoustic music in general—which I had enjoyed for a little while, but not intensely. I moved to Portland and didn’t have any resources to be in a band. The only way I could play was to play acoustic guitar in my apartment, which is where I wrote the first record. AVC: In a past interview, you said that you’re interested in recontextualizing and updating old folk stylings in Horse Feathers. How exactly are you making folk more contemporary? JR: For one thing, the classic tag that people want to use all the time is that it’s folk music, right? Well, it’s not really folk. It’s really pop music because there’s no tradition involved in it, except for little stylistic elements. It’s completely re-contextualized because it’s just almost [about] a mood and feel that has been cherry-picked from American music in general. I’m not interested in playing traditional music. I’m just interested in making new music. Simultaneously, I’m enamored with the effect that old music has, emotionally and aesthetically. The way it can evoke a nostalgic feeling is one of the most striking things about it. AVC: What exactly negates that folkiness? JR: The songs haven’t been passed down in any type of oral manner. “Yankee Doodle Dandy” is a true folk song because you don’t know who wrote it, and it’s been passed down from generation to generation, and the melody is one that everybody knows. People say “folk” all the time, but what they’re really trying to describe [is] that it’s acoustic-based. In 200 years, if somebody learns how to play a song by watching it on YouTube and then passes it down to somebody to the point where they couldn’t find that original clip, at that point it’d start to become folk music. AVC: If you consider the band “new,” what’s most modern about Horse Feathers? JR: The recording process is completely modern. We’re digitally recording acoustic instruments in a way that the sound sounds analog. We also do a lot of multi-tracking, which is a totally modern approach, too. AVC: Why go with digital if you want your recordings to sound analog? JR: The analog process is more expensive, and the ability to use [it] as an instrument in of itself is a lot more difficult and time-consuming. The effects you can get doing it digitally are much more convenient. Also, there’s this aesthetic thing for me, too: I think analog recordings sound good, but for our music, I don’t think that we could get much mileage from it. AVC: Authors and poets are your major lyrical influences. Has that had an impact on your writing style versus you taking inspiration primarily from other songwriters? JR: Absolutely. I’m definitely interested in the way lyrics work and the aesthetic sound of them—oftentimes more than the larger meaning. I try to make them sway to the music as opposed to the other way around, so the poetry is a natural first step. Some poets do that; it’s not so much about what they’re saying, but about how beautiful the words sounded. That works more than a typically straight narrative. AVC: How has writing Horse Feathers’ music in Portland, instead of your native Idaho, affected the result? JR: I don’t know if you’ve been to the Pacific Northwest in the wintertime, but it’s a season of forced introversion. It’s a tangible mood that affects everybody. I’ve noticed it mentally, and that change in climate definitely made me a lot more conscious of seasons in a weird way. AVC: A Seattle Weekly article posited the idea that your music represents everything people love about the Northwest. In writing it, did you consciously want your music to evoke what you enjoyed about the environment? JR: I wouldn’t say just enjoy; I would say it’s more of a natural reflection. It’s more of a subconscious reflection, but at the same time, I’m proud of it. I love where I’m from, and I don’t think that part of me is inseparable from the music. That’s just the way it’s gonna be.